• NOT Aquired Cold Urticaria, (ACU) - aka "allergy to cold"
FCAS is the acronym for: Familial Cold Auto inflammatory Syndrome, also known as Familial Cold Urticaria (FCU). This syndrome is also characterized by autosomal dominant inherited genetic mutation on the NLRP3 (CIAS1) gene that codes the protein cryopyrin. This is an extremely rare syndrome that is present in certain families primarily of North American and European decent, and is estimated to occur at a rate of 1:1,000,000 in these continents. 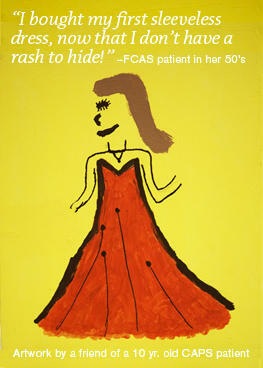 Around 300 people have been diagnosed with FCAS in the United States, but many more may still be undiagnosed. Most people with FCAS are able to lead a normal life, with an average life expectancy, and often have married and had children (which is how some affected families share a the same type of NLRP3 genetic mutation for this syndrome). However, mutations can also occur spontaneously at conception, as it can with NOMID and MWS. There can occasionally be an overlap of symptoms with MWS and FCAS. Many FCAS patients have some evidence of the rash almost daily, but intense attacks of symptoms occur after exposure to cold temperature, or even very cold air conditioned rooms. 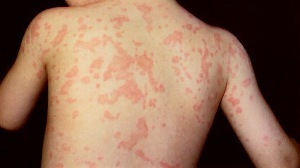 The rash is first to develop, usually within 1-2 hours after exposure, followed by a low-grade fever, and arthralgias (joint aches) about 4-6 hours after the exposure. Most symptoms during an episode last less than 24 hours, and can also include conjunctivitis in the eyes, sweating, fatigue, headaches, generalized pains, extreme thirst, and nausea in addition to the fever, rash and joint pains. FCAS must NOT be confused with Acquired Cold Urticaria (ACU) also known as Cold Urticaria (CU), which is a common, non-genetic kind of allergic reaction to cold temperatures that develops later in life, and presents with symptoms of rash and allergic symptoms within minutes of cold exposure. This condition rarely occurs in infancy, and DOES NOT present with fevers or arthralgias. The rash in Acquired Cold Urticaria (ACU) occurs IMMEDIATELY after direct contact (such as an ice cube put on the skin for a few minutes) and is treated with antihistamines. It is often described as "an allergy to cold"
Autosomal dominant inheritance leads to the passing on of the the CAPS genetic mutation to offspring, and then through family groups for generations. (This means that you can inherit the genetics to cause this syndrome even if only one parent has it). The genetic mutation is in the NLRP3 (CIAS1) region of the cryopryin domain. This is the origin of the "Familial" part of the syndrome name, however a spontaneous mutation of the NLRP3 (CIAS1) gene can occur in families with no other family members with CAPS symptoms. Since FCAS does not commonly cause major permanent damage to the body, as in the other cryopyrin-related syndromes, many people have been able to marry, have children, and have passed on the FCAS gene mutation throughout their family for generations. There are a few large family groups with FCAS, but there can still be some varying degrees of symptoms and suffering within these groups. The age of onset of symptoms is under 6 months of age, but most patients have the rash present at birth, or within the first few months of life. This is common to all the cryopyrin-related syndromes, however FCAS symptoms are often induced by cold exposure, whereas the MWS and NOMID generally have flare ups of inflammation at random, and often with great frequency regardless of the climate. The knowledge of onset at infancy for FCAS is helpful for diagnosis, to rule out other cold- induced conditions, such as Acquired Cold Urticaria, ACU. The duration of the majority of the attacks with FCAS is less than 24 hours from the first signs of symptoms after cold exposure. But in that time, the person suffers greatly from many symptoms, which may include: rash, fevers, fatigue, chills, joint and other pain, conjunctivitis (redness of the whites of the eyes), extreme sweating, headaches, excessive thirst, blurred vision, and nausea. All patients with CAPS, regardless of the severity of chronic inflammation suffer greatly during syndrome flares. The presence of conjunctivitis (irritation and redness in the white area of the eye) with attacks or flares of FCAS. This can also occur during flares with NOMID/ CINCA and Muckle-Wells Syndrome, but people with FCAS do NOT generally have the other persistent eye inflammation issues present, as seen in NOMID patients. In FCAS patients, there is NO evidence of periorbital edema (swelling around the eye orbit), lymphadenopathy (enlarged lymph nodes), or inflammation of the pleural, peritoneal or pericardial cavities in the body (serositis). It is uncommon to have hearing loss, but it can occur in some patients with more of a FCAS/MWS overlap of symptoms. Kidney disease from amyloidosis is uncommon in FCAS, and occurs in less than 2% of patients. Please read about amyloidosis on the page about Muckle-Wells, as it is more common in that form of CAPS. Until targeted medications for CAPS were available, people with FCAS had to treat their symptoms with warming treatments, along with non-steroidal anti-inflammatory drugs (such as Naproxen, Ibuprofen etc.) High doses of corticosteroids were effective, but most patients would rather avoid the short and long-term side effects of those drugs, in comparison to the symptoms of FCAS. Currently, the best treatments found to help the many of sufferers of MWS have been the use of various Interleukin-1 blocking, trapping or otherwise attacking drugs to prevent the cellular uptake of Interleukin-1ß in CAPS patients. There are some medications that are FDA-approved and very effective for FCAS. For more information, please go to the Treatments page.